Ed Boudreaux’s Bayou BBQ, Asheville NC (CLOSED) – Marie, Let's Eat! I admit, concede and confess that it is really, really unfair to judge a restaurant based on its performance during a giant downtown festival that brings a couple of hundred thousand people right outside and keeps the wait staff and kitchen working overtime, all the time. 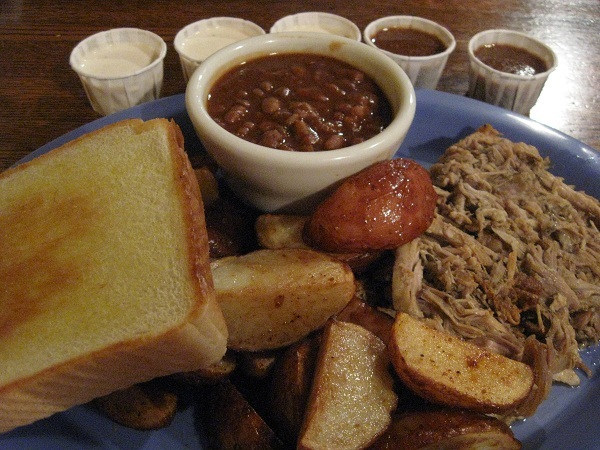 However, the northern Alabama-styled white sauce at Ed Boudreaux’s Bayou BBQ on Biltmore Avenue in downtown Asheville is really, really terrible. It’s the worst, the pits, the lousiest, and I was so looking forward to it that I am aggravated enough to mention it first and foremost. Hopefully, readers who have been following our adventures have noticed that we don’t feature negative reviews here. I certainly enjoy reading well-written criticism, and I’ve been known to dole out the harshness on my book review page, but I think that it runs counter to this blog’s mission, to tell stories about a life spent eating well. To that end, we’ve deleted photos and crossed a couple of places off our list that we’re not going to revisit, but otherwise I’ve kept quiet about it. Ed Boudreaux’s, however, is pretty darn good, and I fully intend to stop in again many more times to come, for some good reasons I’ll get to. That white sauce, however, it’s just godawful. If you’ve been following along, you’ll know that since I discovered the stuff in the spring, I’ve been crazy about white sauce. I’ve loved the recipes found at Hawg Wild in Clarkesville, Georgia and Miss Myra’s in Birmingham, Alabama. I was stymied in my plan to try the white sauce at a place in Hamilton when we drove up to Memphis last month, because the darn place is – get this – closed on Saturday. Since there’s no finer time for eating barbecue than on a summer Saturday afternoon, I still don’t know what to think about that. Ed Boudreaux’s big shtick is their ridiculous number of sauces – we think there were fifteen of the darn things, all available from pump stations at a serve-it-yourself bar. The restaurant itself reminds me of the taverns on Broad Street in Athens. It’s a big space, high-ceilinged, dominated by a bar and it’s really loud, and everybody contributes to the noise going back and forth to try more sauces. Most of these sauces were very disappointing, but there were some winners among them. My son really liked the Georgia Peach, Marie liked the Memphis-style and I liked both the Kentucky Black (Worcestershire) and the Rebel Uprising (mustard) sauce. Most of the other sauces, however, especially the white, were ruined by either far too strong a vinegar, or far too much of it. The cider vinegar used here was so strong and so pungent that it overpowered everything else in their respective recipes, and about five of the sauces tasted exactly the same as each other. I genuinely could not tell the difference between some of the cups that I brought back to the table. I’m willing to grant the place a little leeway – during a festival as wild as Bele Chere, I can understand eyes coming off the ball – but only because the meat and the sides, particularly the baked beans, were so darn good. I really like those baked beans, and will have them again. 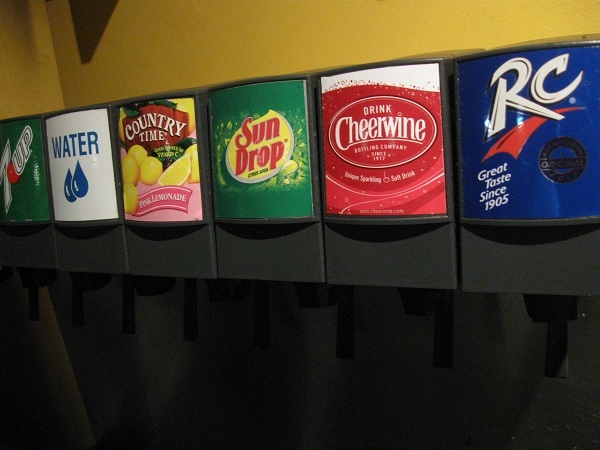 I know of one other place that serves draft RC, but I don’t think I’ve seen Cheerwine or Sun Drop in a fountain before. This is the sort of attention to detail that I applaud in a business, and frankly, that’s reason enough to stop in every time we visit Asheville. Fountain RC is terrific! Update, 4/3/12: Word reached us this weekend that Ed Boudreaux’s has closed both its restaurants in Asheville and Brevard. I regret not giving them another try, under non-festival circumstances. Fountain RC, meanwhile, is said to still be available in town at Luella’s. Posted on July 27, 2010 July 29, 2017 by Grant G.Posted in asheville, barbecue, goodbye, north carolina, sodaTagged asheville, barbecue, closed!, north carolina, soda.